After installation, restart Firefox. 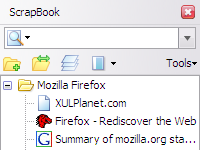 Go to Firefox menubar, [View] > [Toolbars] > [Customize], drag-and-drop ScrapBook icon onto toolbar. I happy to announce the update of the tutorial written by Andrew Giles-Peters. It is now based on ScrapBook 1.2. ScrapBook was developed initially at Murota Laboratory, which is a member of the Chair of Human Resource Development in the Department of Human System Science at Graduate School of Decision Science and Technology, Tokyo Institute of Technology. Following extensions, Web pages are highly useful guide for developing ScrapBook. Special thanks for them.